We are excited to say, we are now offering trips on Lake Martin! Call for details (205) 544-1310 or (334) 300-2474. We are proud to say, we are now selling shad! Contact us to get location of business. Check out the television program below, we were on. Cookin' It Wyld Style! 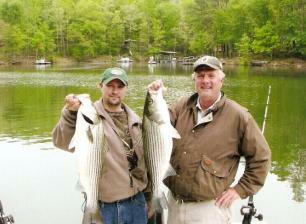 Stripemasters has 20 years combined experience Striper fishing <?XML:NAMESPACE PREFIX = ST1 />Smith Lake. We fish all year round full time, keeping up with the habits of these large fish. <?XML:NAMESPACE PREFIX = V /><?XML:NAMESPACE PREFIX = W />We utilize different techniques in different times of the year. Most fish are caught on live shad, but we always like to be casting artificial to up the odds. We catch our own bait and are experts at keeping shad alive. We prefer using big Gizzard shad except during December - February, smaller bait seems to do better. Message: I have gone on a few trips with Mike and Mark and it is always a top notch experience. 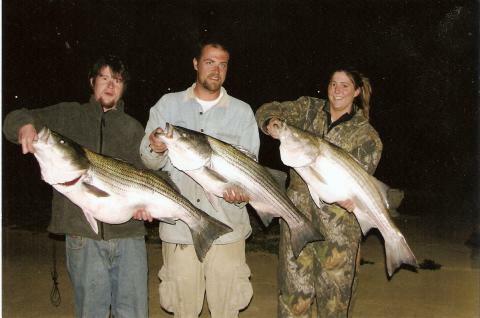 My average Striper is 14lbs with these guys. I would recommend them to anyone. Message: I have fished this lake with Mike. He wants you to have a good time, he will attend to your needs but most of all he wants you to CATCH FISH and will take you anywhere on the lake to do this. These guys keep the fun and excitement in fishing. Message: These guys do a great job! They are very passionate about what they do. They're not just in it for money. Message: Just returned from a great trip with Stripemasters. My sons (7yrs & 10yrs) caught 4 stripers in less than 4 hours!!! Smallest fish was 10 pounds and the biggest was caught by my 10yr old - a whopping 30 pounder!!! Thanks Stripemasters for a trip me and the kids will never forget.